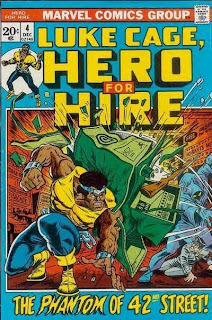 Luke Cage, Hero for Hire was first introduced by Marvel at the height of the blaxploitation films that hit the silver screens in 1972, when Richard Roundtree starred as Detective John Shaft. Archie Goodwin was chosen to produce the snappy "hip" scripts as George Tuska did the art chores. 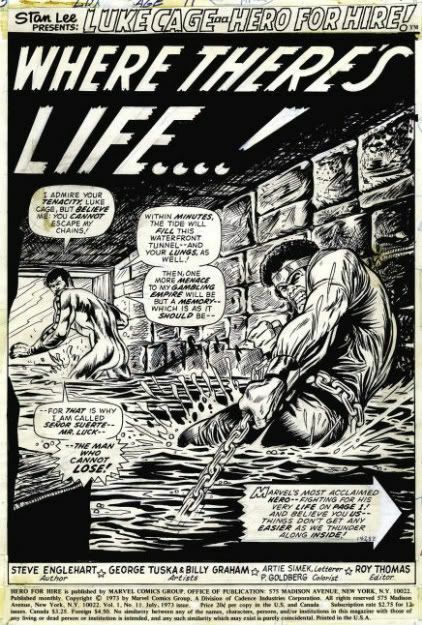 One of the rare black cartoonist in the field, Billy Graham, was inker for their new sly African-American private eye/superhero series. Sent to a maximum security prison for a crime he didn't commit, Carl Lucas volunteered for a scientific experiment in order to be paroled early, and find the real crook who framed him. Like other supermen before him, the experiment Lucas was involved in went terribly wrong, turning him into a "bulletproof brother" who busted out of prison to seek his revenge. 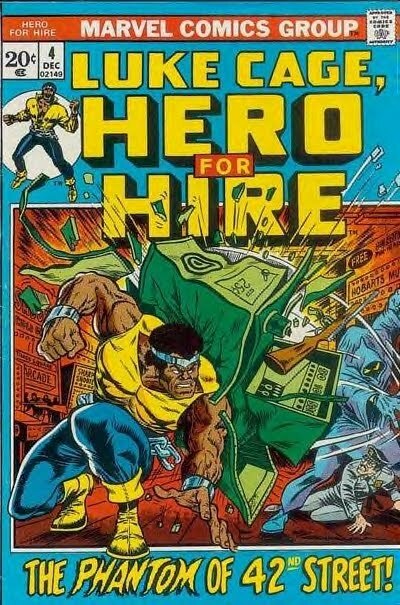 Wanting to profit from his new found skills, he changed his name to Luke Cage and set up an office on West Forty-Second Street to charge high-dollar clients for his new superhuman assistance. So was the story of Luke Cage for many years until the sales on the series finally dropped. Marvel then started calling him the Powerman and teamed Cage up with the martial artist Iron Fist to capture a whole new audience. Recently the popular character has been revived once again in a solo title with adult edgier story lines for the ultimate tough guy title simply called Cage. Tales of the Bizarro World!